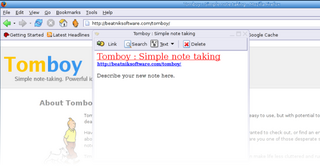 Wereboy is an extension for Firefox which allows you to take notes in Tomboy from your browser. It allows you to click an icon on your Firefox toolbar to create a new note in your Tomboy directory. The note will be titled with the title of the current webpage, or the text you have currently selected. It will also put a link in the note to the web page you were on when you created the note. After installing Wereboy, right-click a toolbar, select "Customize...", and drag the "Wereboy" button to your toolbar. Why is it named Wereboy? In the fine tradition of kludging two names together, I first came up with Foxboy, but decided Wereboy sounded cooler. Then, a few minutes into coding I realized "Wereboy" actually has the nonsensical meaning of "Manboy", but stuck with it anyway. Wereboy was coded using Jesse Ruderman's simple Thumbs extension as a skeleton for a Firefox extension, and is licensed under the same open terms. That is, LGPL, GPL, MPL. Doesn't pop up the relevant Tomboy note window when a note is created. Doesn't inform Tomboy that the note has been created, won't show up in Tomboy's list until Tomboy reloads the notes directory.